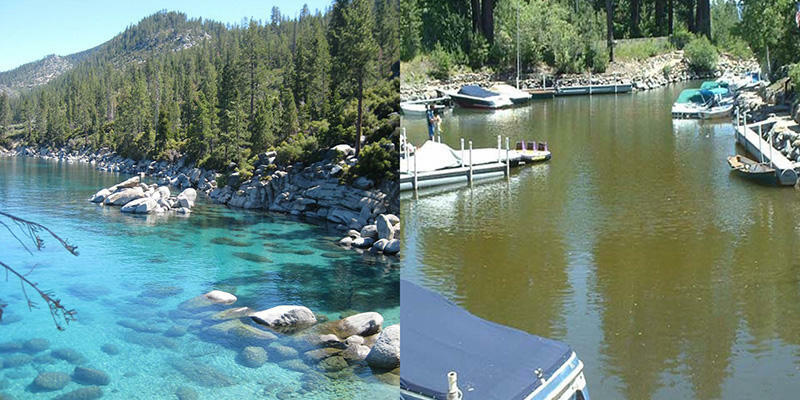 The "browning" of the world's waters, shown here in two pictures from different parts of Lake Tahoe, is negatively affecting the ability of UV rays to kill pathogens. Ultraviolet light is nature's way of purifying lakes, rivers and coastal waterways. Researchers led by a Miami University professor are quantifying how climate change is negatively affecting nature's ability to do its job. Craig Williamson, a biology professor and Ohio Eminent Scholar of Ecosystem Ecology, says extreme rainfalls are washing more organic matter into waterways creating a browning effect. UV rays are unable to penetrate the darker water and kill dangerous pathogens. It's probably the most important factor in terms of disinfecting surface water of parasites and pathogens globally. "About 68 percent of waterborne disease outbreaks are preceded by extreme rain events," Williamson says. "People in the past have thought this is because it washes the pathogens into the water. But our work is showing that not only does it wash the pathogens into the water but provides this browning that absorbs UV and prevents disinfection." According to the U.S. Global Change Research Program, each year 12 to 19 million people in the U.S. alone contract an infectious waterborne disease. "In terms of floods and precipitation, we think about the cost of the damage in terms of loss of property, but there's a huge cost involved in the potential increase in these waterborne diseases," says Williamson. "We're talking about over ten million people per year in the United States that get waterborne diseases." The problem affects recreational water use, coastal fishing and makes purification more difficult for water treatment plants. "People don't think about ultraviolet radiation much, or if they do, they think about avoiding a sunburn, but it actually can have some beneficial effects. It's probably the most important factor in terms of disinfecting surface water of parasites and pathogens globally." The study involved multiple scientists from different disciplines who serve on the United Nations Environment Programme Environmental Effects Assessment Panel (UNEP EEAP). The data collection and modeling foundations used in this study were funded by multiple grants from the National Science Foundation. For the study, Williamson and his colleagues relied on water samples collected from lakes from Pennsylvania and Wisconsin to Chile and New Zealand. Water samples were tested to determine how much dissolved organic matter each contained as well as determine the wavelengths of light — including ultraviolet wavelengths — absorbed by that organic matter. Then-NCAR scientist Sasha Madronich calculated the solar inactivation potential (SIP) for each lake. SIP is an index of the expected disinfecting power of UV light in a particular body of water based on its dissolved organic matter and other characteristics. He used the Tropospheric Ultraviolet-Visible model — which simulates how UV light is scattered and absorbed as it passes through Earth's atmosphere — to determine how much UV light hits the surface of the lakes throughout the year. Madronich also analyzed reflection and refraction off each lake's surface to calculate how much light penetrates the lakes and how deeply it reaches. Because scientists already have some understanding of which wavelengths of UV light are most damaging to which waterborne pathogens, the scientists were able to use the model output to calculate the SIP for each lake. In some cases, they also calculated the SIP across different parts of, or for different time periods in, the same lake. The results allowed scientists to quantify the impacts of dissolved organic matter. For example, the summertime SIP for one lake in northeastern Pennsylvania — which, along with other regional lakes has undergone significant browning in recent decades — dropped by about half between 1994 and 2015. 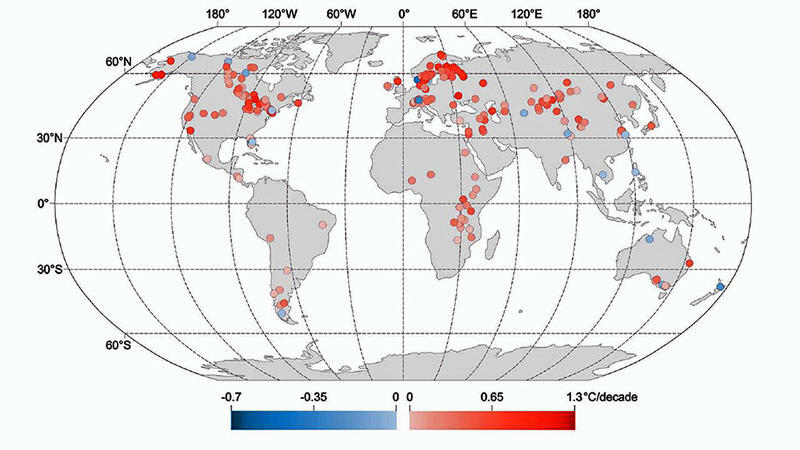 Rapidly warming surface water temperatures in lakes around the world are threatening freshwater supplies and ecosystems. That's according to a 25-year study of 235 lakes on six continents. With Thursday's ribbon-cutting ceremony at the new UV Disinfection Treatment Facility, Cincinnati will lead North America in water treatment. It will be the first to use UV disinfection following sand filtration and Granular Activated Carbon during the treatment process.